When The Good Place presented at its first Television Critics Association press tour, my question was tied to the fact that it was a rare breed: a television comedy without a status quo, or without what appeared like one. I don’t remember the specifics of creator Mike Schur’s answer, but it boiled down to “yes, that is by design.” It was a significant risk for the show, and one that’s paid off creatively. I raise this anecdote now because it’s becoming clear that Orange Is The New Black is working to try to establish a new status quo after blowing the last one up during the riot, and it’s proving to be a difficult task. While Litchfield was always on the brink of destruction, there was a status quo to the daily lives of these inmates, and the threats to it were either eliminated (Vee in season two) or eventually subsumed into the larger prison culture (the new inmates of season four). 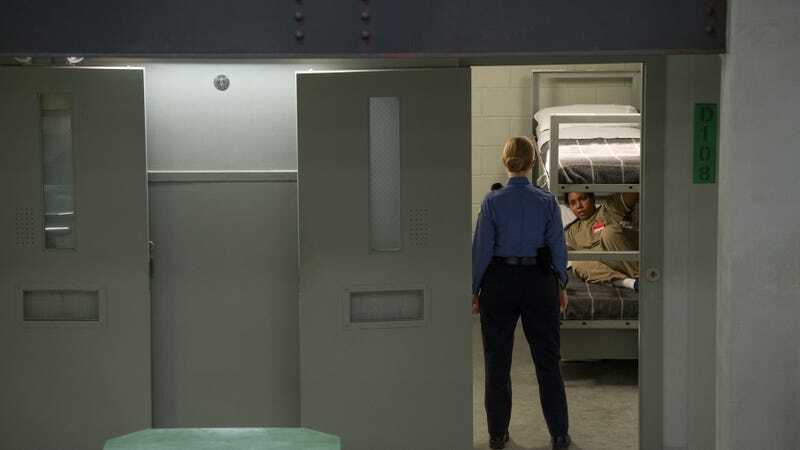 Litchfield has changed since Piper first entered the prison, but the core rhythms of the show haven’t, and even during the riot the show leaned heavily on those rhythms in order to make the show feel less off-kilter than the premise of the season first indicated. But now, the show has built new standing sets, and introduced a new cast of characters, and has given every indication that none of the show’s central characters will be returning up the hill any time soon. It wants us to see Max as a new home, and in order to do that it has to create a status quo that registers as such. That work has been complicated by the amount of unfinished business from last season: here, for example, the work being done to flesh out Max through Mischief Night is constantly having to share time with Pennsatucky and Coates concluding their grand adventure. It feels like the last vestige of the old Litchfield, and so the show should be in the clear from this point forward, but there’s still the question of whether we’re going to be seeing any of the other inmates again, and there’s still clearly unanswered questions from the riot after Red and Taystee finally meet and make clear to the other than they did not kill Piscatella. There’s an inherent tension in the show right now between the clear desire to “reboot” the story in Max and the need to unpack what went on last season, and it’s keeping the show from tapping into its rhythms as easily as it may want to. That’s not to say there isn’t some compelling story to be found in this tension. Ruiz already had ten years added to her sentence, but she’s being punished again by having no allegiances, and her desire to just sleep away her days is disrupted when Blanca gets the word to D Block that she was the one who allowed the guards to escape. And while there’s no indication that Ruiz wants to do anything other than settle into the next 10+ years of her life, no one is willing to let her do that. Meanwhile, on the other side of the conflict, the guard who chose Ruiz in the fantasy league isn’t faring much better: McCullough barely recognizes herself in light of what happened, and it’s no coincidence they each end up in the bathroom stall after trying to find their true selves in the mirror. 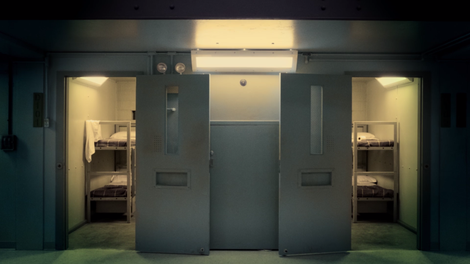 But while McCullough is putting out cigarettes on her legs and successfully hiding her PTSD, Ruiz has no such luxury—she has nothing to cover the bruise on her face, and there’s nothing she can do to stop someone from shoving her head in the toilet, at the very least coming close to drowning her. There is no “status quo” for either of these two women after the riot, albeit within very different positions vis-à-vis power. To the episode’s credit, the same tension is at the heart of Pennsatucky and Coates—unfortunately, this storyline is still a complete mess. It does finally resolve itself here, but only after Coates once more demonstrates his controlling and abusive demeanor, this time as he refuses to allow Pennsatucky to turn herself in, and just in general embodies toxic masculinity. Nothing about this storyline has been good all season, but I have to admit there was something very satisfying about seeing Pennsatucky start the fire he failed to and then walk off to turn herself in. The show stumbled through the power dynamics of this relationship after a powerful start, I think mistakenly believing they had established there was some kind of status quo on the horizon for the couple that could make people root for this. But that was never feasible, and seeing the show admit that is a good development albeit one that does nothing to make the continuation of this story after the beginning of the riot worthwhile. Coates gets the “outline the theme” line during his time in the woods with Pennsatucky: “Everyone’s just one hard decision away from having a whole different life.” This is true, and the episode didn’t even need a flashback to underline it, as it lies at the heart of this season. Lots of people made difficult decisions during the riot, and their lives may be very different because of it. However, for the show on a macro level, they don’t want it to be completely different. Mischief Night becomes a way for the show to explore what day-to-day life in Maximum Security actually looks like, albeit framed by the guards’ behavior reorienting in the wake of the inmate auction that opens the episode. And it’s not that dissimilar to life up the hill on the surface: there are factions at each other’s throats, and pranks pulled on newcomers and rivals. The difference is that a mere prank can escalate into a full-on war with little notice, and even the once neutral territory of Florida has the potential to turn into a battlefield in the blink of an eye. Frieda starts the episode saying she’d rather be locked in a room of bees than be Suzanne’s bunkmate, but once Suzanne accidentally dislodges the sharpened sticks from under the table, she signs on for the full Suzanne experience just to have a line of defense from Carol’s revenge making its way into her safe space. Max is maybe not a completely different life than these prisoners were used to, but the distinctions are nonetheless clear, and felt most strongly by those who are either privileged white women like Piper or vulnerable women like Ruiz with no support structure. “Mischief Mischief” doesn’t quite have enough momentum to make the rat prank land in any significant way, and I’m not fully sold on any of the new characters as of yet, but Pennsatucky turning herself in should signal the beginning of a move forward for the show, which will be the real test for the status quo that might well carry the show into its series finale in the next couple of years. My one big issue with Max so far is that it’s sort of absurd when members of the supporting cast don’t appear in a particular episode: it was one thing in Litchfield where it always seemed possible that they were just in a corner of the prison we weren’t paying attention to, but they are now in much more confined spaces, and it feels weird to have an episode where Flaca and Cindy just completely disappear into thin air. That said, the Fantasy Auction brings yet another mention of “Barbara Denning”—Barb from the flashbacks—despite the fact she has yet to make an appearance, so maybe there’s a Room of Requirement where these characters are hanging out that we can’t see them. Nicky has some history with Daddy, who now has Daya full-on dependent on the oxy, which is going to go south very quickly. Frieda holding out with a dead cellmate for three whole days for the peace and quiet is peak Frieda. Interesting to see Alex outright making friends with Badison—she did it for Piper, or at least to make Piper more bearable, but it’s also a reminder they are very different people, and approach problems differently as a result. I’m curious what their relationship evolves into in this new environment. So it turns out that Linda being discovered didn’t fix the count, so it isn’t until Linda and Fig’s meeting—where Linda wrongly believes Caputo purposefully tortured her by sending her to Cleveland—that it becomes clear that Chang wasn’t the only inmate who was unaccounted for in the initial count. I’m no computer expert, but I feel like it’s dangerous to upload sensitive government data like inmate records into a hacked third party fantasy football application? Are we going to circle back to this, or was this just the show stretching credulity to give Luschek his moment?